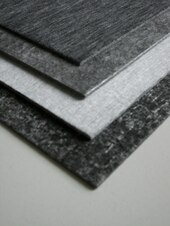 SymaLITE is the name given to its special lightweight composites. These Low Weight Reinforced Thermoplastics (LWRT) make up a product group of special lightweight plastic composites with low thermal expansion and excellent mechanical and physical properties. The mixed glass and polymer fiber fleeces produced in special textile processes are supplied as rolls and boards and can be cost-efficient further-converted into three-dimensional components by low-pressure moulding. The ultra-light, freely shapeable SymaLITE thermoplastic is noise-absorbent and can be faced directly with functional and decorative cover layers without adhesives having to be used. This eliminates an entire production step. As a panel, SymaLITE can be utilized in place of plywood, thin plies of tropical timber, fiberboard and polymeric rigid foams. Molded into a three-dimensional component, SymaLITE can even be given different wall thicknesses within the component. Mitsubishi Chemical Advanced Materials Composites supplies SymaLITE as pre-consolidated boards with areas per unit weight of 700 to 2,200 g/m² (with variable shares of PP and glass). The usual board thicknesses range from 2.5 to 6 mm with a maximum width of 2.3 m.
As a durable, noise-insulating material for car undershields, engine and gearbox covers etc. As a substitute for wood-based materials and rigid foams in sandwich constructions for the caravan and commercial vehicle industry.